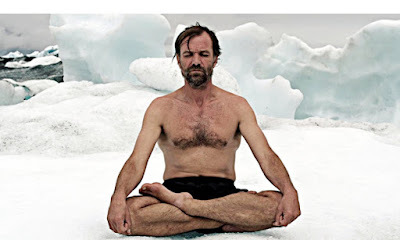 Last night, my girlfriend & I watched a VICE documentary about an extraordinary man named Wim Hof, also known as The Iceman. After the suicide of his wife, Wim decided to use his grief as motivation to learn extreme levels of self-control. Through meditation and breathing techniques, Wim is able to control his physiological functions to withstand extreme temperature, pain, and even control the body's autoimmune processes. He has been extensively studied by researchers, and was even injected with an endotoxin- which his body was able to fight without the normal elevated, inflammatory immune response. Wim is a living example of the ability for the power of the mind to overcome the perceived physical limitations of the body. Here is a video of a TED talk he gave outlining his approach. His method resembles the Tibetan meditation technique of "Tummo" or "Inner Fire". Using this technique, Buddhist monks living on the chilly plateau of Tibet would stay out in the elements overnight, wearing nothing but a wet cloth. As I wrote in my last post, my family recently spent a week on our annual vacation in the Poconos, PA. I added some more pics to the photo album, mostly nature pics & photos of the lake. One picture I did manage to get of wildlife as this photo of a water snake that was swimming by our dock, popping his head out of the water to take a look at us. There are many deer who are accustomed to humans in the lake community. I was playing with my nephews one evening in the back yard, & I saw a pair of deer right behind them. I told them to be quiet & stay very still. One of the deer came right up to David, so I told him to start stepping away from it. Then, Gregory went right up to one at the edge of the woods & was watching it. We had a house that was perfectly positioned to see the sunsets over the lake, so we spent a few evenings outside on the deck or the beach watching the sun go down over the trees. It was another great vacation week with my family, even though my girlfriend couldn't make it since she was studying hard & taking exams for nursing school. Here is a family portrait we took on the steps of our house. A couple weeks ago, my family took our annual summer vacation in the Poconos, Pennsylvania. We usually check into to our house on a Saturday, and for the last few years we've gone on Sunday morning to the Blue Ridge Flea Market. We all enjoy going to buy random stuff & see all the crazy crap people are selling. This year, the first thing I saw as we were pulling up was this truck, with www.junkologist.com hand-painted on the sides. Yes, it's a real (high quality, suprisingly) website, for a junk removal & cleanout service. For years, we've been playing a game my sister got us into where everyone looks for the craziest/funniest/weirdest items we can find for under $5. It's one of my favorite games ever, because it forces you to keep an eye out for truly interesting things. 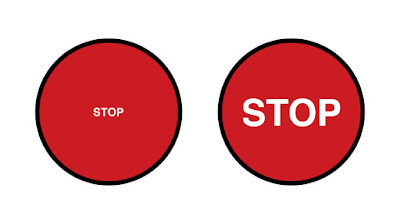 I saw this post on BoingBoing and, as a graphic artist, I thought it was a great account of trying to teach young kids about design. I have nephews who are 4 & 6, and I've explained my job to them when they asked. They know that at my work I create toys and make cool artwork. However, I haven't really gotten into any fundamentals of design concepts with them, other than basic shapes & colors. Understanding the art of design is crucial to understanding the world and the many subtle clues all around us. Even children can begin to pick up on nuances of design choices in our world and what meaning they have. If a child is responsive and you can get on their level, you can teach them many ideas . One just needs to be creatively simple in the explanations. 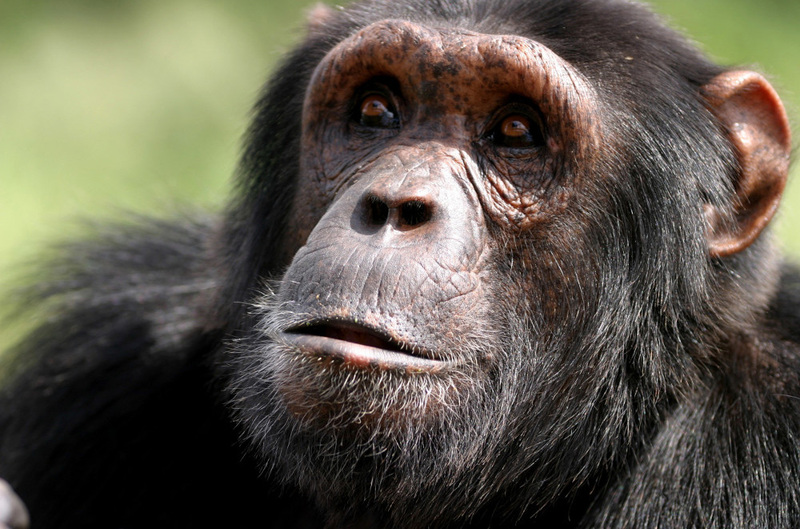 In recent posts, I've talked about primate tool use and primate self-reflection. I'm very interested in the nature of animal consciousness & communication, because I think it informs the fundamental nature of our own experience. I think humanity is becoming more empathetic as a whole, because other living things are being recognized as sentient minds. This video speaks for itself, and needs no philosophical debate. It shows chimpanzees from research laboratories, who were locked in cages for 30 years, being released into a sanctuary. I can't see how a person with any empathy couldn't look at these chimps & recognize the experience they must be having when setting foot outside for the first time in decades. I am a huge proponent of meditation, the simple act of practicing stillness in the body and the mind. If meditation techniques were taught to school children, we would eventually have a more sane society. This is a funny take on the popular guided meditations that are online. In a sense, it's pretty accurate, despite the humorous intent. To let go of all the worries and anxieties of the world, all you have to do is say, "F*ck That". This is a pretty messed-up fake ad I saw on this isn't happiness. 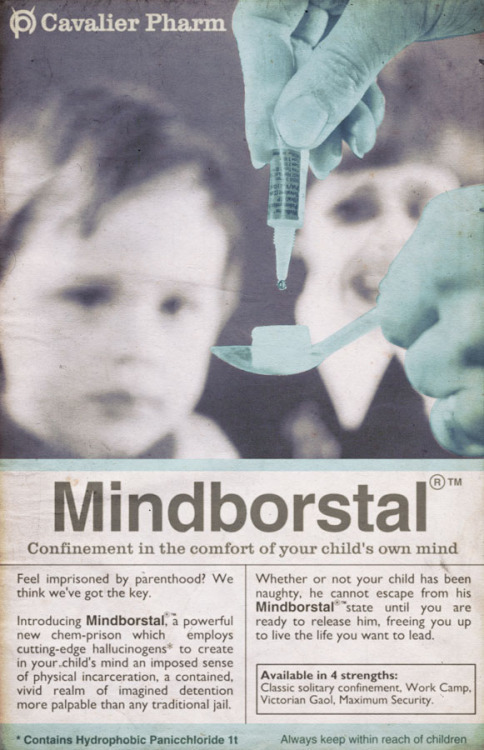 It's for a fictional drug called Mindborstal®, for horrible parents who want relief from their children's active minds. Read the fine print for the full, disturbing details: "Confinement in the comfort of your child's own mind". "Always keep within reach of children"
This video of a mesmerizing & beautiful dance routine by Japanese troupe Enra shows the wonderful possibilities of interacting with digital media. We are beginning to blur the lines between "real" & "virtual" by directly interacting with light. The performance is called "Pleiades," after the star system also known as "The Seven Sisters," which is hinted at in the photo above. This star cluster was used as part of a seasonal calendar for many ancient civilizations. On Graham Hancock's site I saw another news item that reminded me of the evolutionary jump presented by "2001: A Space Odyssey". Although we consider the use of tools to be a main difference between human beings and other life, there are many animals that have learned to use tools for specific tasks. Although they are certainly not building particle accelerators or spacecraft, clearly other primates have the ability to intelligently manipulate their environment to achieve predetermined goals. In fact, chimps have even been able to recognize dangerous human technology, in the form of snares, and sabotage them. Regardless of the capacity that other life can use tools, it is clear that technology defines us as human almost as much as any other factor. After my last post about the poster featuring the proto-homonids in "2001: A Space Odyssey", I saw this animated GIF of a gorilla seeing itself in a mirror. 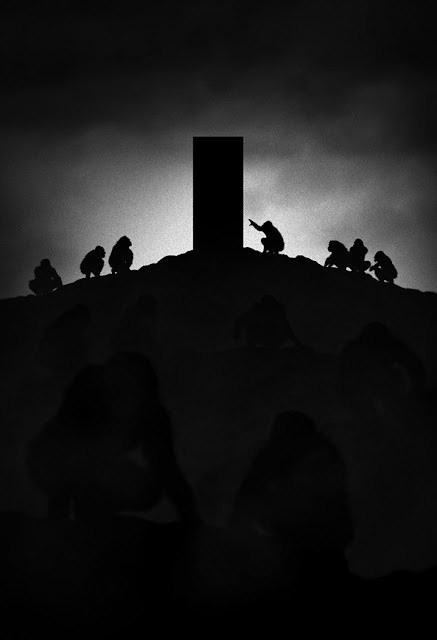 The gorilla's reaction is similar to that of our primitive ape ancestors in the movie, when faced with the evolutionary catalyst of The Monolith. Both objects facilitate self-awareness in the consciousness of the animal mind. Different primates have varying degrees of ability to recognize the reflection in the mirror as themselves. Can Monkeys Learn to Recognize Themselves in the Mirror? This weekend, during a break from celebrating Independence Day, I got into reading some ideas about the meanings in the movie 2001: A Space Odyssey. It is one of my favorite movies, because of its artistic vision concerning the evolution and future of humanity. On this isn't happiness, I saw this cool poster by Marko Manev, from a series of "Noir" posters. The artist also created this set of posters that I liked from the Star Wars trilogy. I saw this animated GIF on Awakening Our Truth. The original source is dimensao7. It shows the construction of "The Flower of Life" pattern, from a series of interconnected circles. The Flower of Life is a symbol used in sacred geometry. This is the study of mathematical properties of nature, relating to the common forms found throughout our reality. Contemplating the mysteries of this timeless pattern brings a greater understanding of the creative forces that make up our Universe. 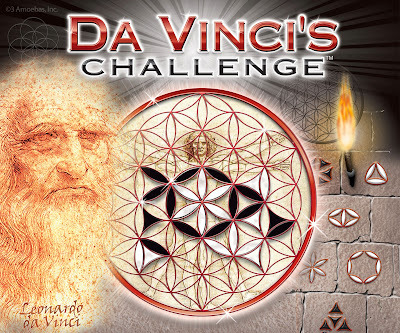 I used the Flower of Life symbol as the basis for the strategy game I created, "Da Vinci's Challenge".